Stay tuned! We will be adding more event information soon. Follow us on Facebook to be sure to stay updated with our event details! You can also email us at faithrendered@gmail.com to be added to our monthly email list. Text 210-389-8838 for event details. Being a Eucharistic-centered ministry, we take part in many different types of events that are focused on the Eucharist and the Word of God. We also have consecrated our ministry to Our Lady of Grace, and do our best to assist in special occasion events for Mary. We ask that you keep our events in prayer as we are always in need of prayer support for our music to continue to lead people to a deeper relationship with God. We invite you to listen to Catholic Radio! Hear about events all around the greater San Antonio area! Love the Spurs? Love your Catholic faith? Then, join us on Wednesday, November 29, 2017 for Catholic Spurs Night! Ticket link available soon. Tickets average $35 and include an exclusive tshirt, hot dog, drink, chips and a praise and worship concert after the game provided by Faith Rendered!! Bring friends and spread the word…let’s pack the place! The Pro-life Holy Hour takes place on the third Tuesday of each month from 6-7pm CST. St. Joseph Catholic Church – Downtown parking is free when you present your ticket at the event to be validated. These events are free and open to the public. Occasionally, the priest has other obligations, so please check our FB page for updates on this event. Don’t miss our praise & worship night in San Antonio, Tx! 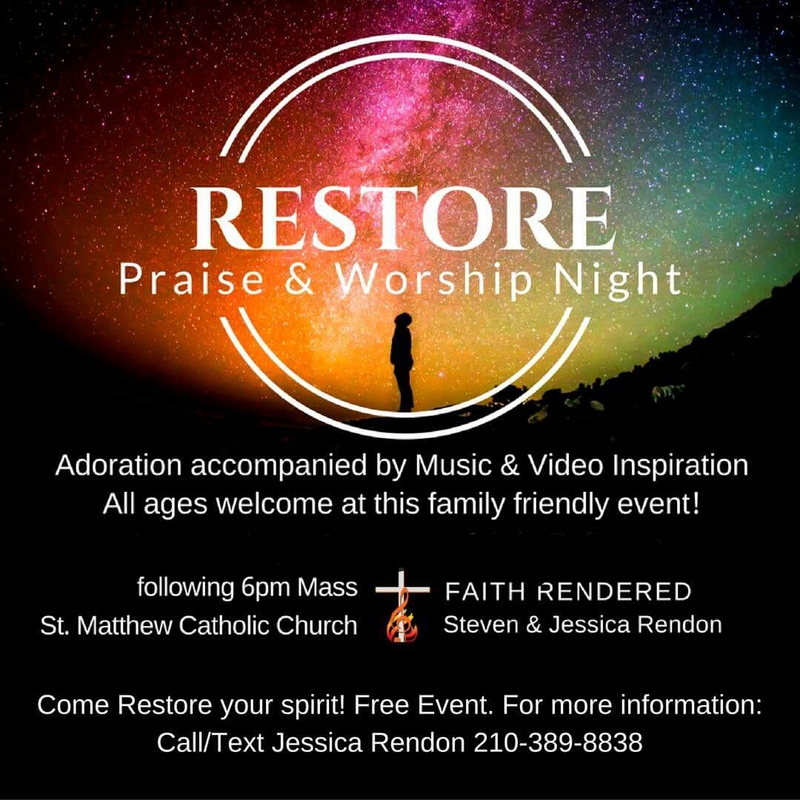 Our RESTORE event will take place at St. Matthew Catholic Church every third Thursday from 7-8 pm with a reception to follow to promote fellowship. Free public event for all ages! This event includes praise & worship music to encourage families to worship together. The St. Matthew Adoration Chapel is perpetually open for those that seek to have quiet Adoration time outside of these events and Mass times. St. Matthew has something for everyone! Men and women in their 20s and 30s are encouraged to attend a young adult Saturday morning retreat to prepare for Advent and also for Lent. We are blessed to provide music for these events and look forward to seeing many young Catholic professionals there to grow in faith and work in witness for Christ. Location: TBA. Find YCP SanAntonio on Facebook for more event details. Every month we sing out at the Schoenstatt Shrine in Helotes, Texas! The beautiful ministry focuses on Marian spirituality and has a dedicated and welcoming community. Located on the side of a hill, you will be sure to experience the peace waiting for you at the Schoenstatt Shrine. Event dates added throughout the month. Visit our Faith Rendered FB Page to get more current event information. We invite you to support parishes in downtown San Antonio! May we all do our part to keep these beautiful historic churches open. Occasionally we sing for Sunday Mass at St. Mary’s Catholic Church in downtown San Antonio, Texas at 6pm CST. (except the last Sunday when we sing at St. Matthew Catholic Church) Stay tuned for details or send us a message! We are blessed to provide music every year for the blessed healing ministry of Alan Ames. We are grateful to inform you that Alan Ames will be in San Antonio the last week of October. We will be providing music for his healing services at the Our Lady of Lourdes Grotto – Oblate and St. Matthew Catholic Church in October. Please keep him, his family, and ministry in your prayers. Click here to read more about his ministry and event dates as they are scheduled. We are blessed to join with Fr. Sean Salai SJ for a powerful young adult retreat the first weekend of February 2018. A team of young adult Jesuits will facilitate this retreat for 150 young adults of the greater San Antonio area. Mark your schedule and be ready to set your heart on fire for Christ. Check our FB page for registration links. Special thanks to the coordinators of Worship on the River for allowing us to participate in this great event! Our next date to join this event will be posted soon. Our next date to play for this event can be found on our FB page. Be sure to follow us on Facebook to get the quickest updates!